Hi friends! I'm so excited to share that I've guest written for Britney over at Seams and Sprinkles today! Be sure to visit her blog and check out my Creamy Lemon Pie. It's a perfect blend of tartness and sweetness- the best way to bid adieu to summer. You can also follow her on Instagram. I apologize for being MIA last week. We packed our bags and headed down to the Outer Banks for a week of RRR and getting a great tan. It was wonderful! [I would live by the water if I could.] 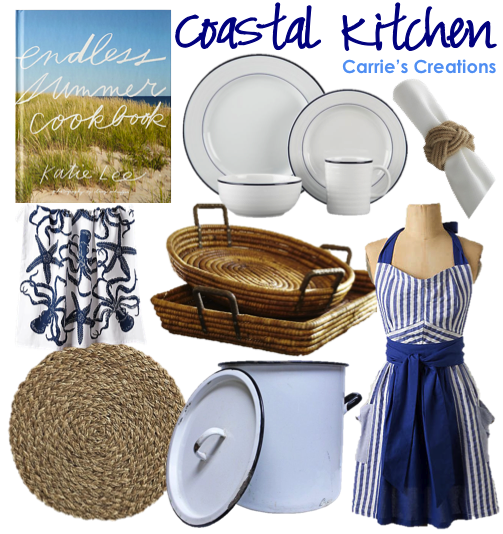 Since the beach is still on my mind, I wanted to follow up my Farmhouse Favorites post with some of my favorites for a timeless coastal kitchen.